Oprah Winfrey has tweeted the first look at Jane Fonda as former first lady Nancy Reagan in The Butler, an upcoming film that spans several decades in the White House. 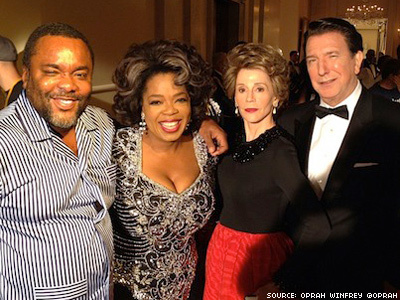 Winfrey, who plays the wife of the title character, tweeted a photo from the set, saying, "Director @LeeDaniels, @JaneFonda as Nancy Reagan, Alan Rickman as Prez Reagan and me gonna be a long nit." Fonda, respected by many as an outspoken liberal activist, will reportedly appear in just a few scenes as the conservative wife of President Ronald Reagan in the film. Daniels adapted the screenplay with Danny Strong from a Washington Post story about Eugene Allen (Forest Whitaker), the White House butler whose career started in 1952 with Harry Truman and ended 34 years later with Reagan. Besides Fonda, Rickman, Whitaker, and Winfrey, the film's all-star cast includes Mariah Carey, John Cusack, Lenny Kravitz, James Marsden, Liam Neeson, Liev Schreiber, and Robin Williams. Daniels is currently filming The Butler on location in New Orleans.